G&Tea, a new venue at The Star Sydney, is something of a chameleon – shifting from a tea house by day to a gin bar by night. During the day, guests can enjoy an extensive artisan tea range, all the way up to the $120 a pot Yellow Gold Tea Buds by TWG, or a Gong Fu Tea Ceremony led by a dedicated Tea Master. But during the evening, the rainforest-inspired venue transforms into a bar. 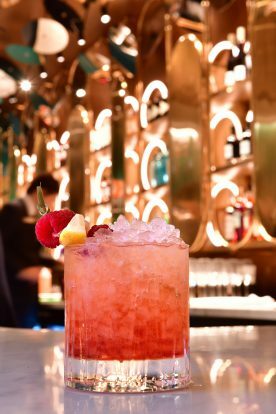 Alongside the traditional G&T’s and martinis – or modern fusions like the ‘Gin Spritz’ made with Ink Gin, Prosecco, soda and an orange slice – there’s also a selection of tea-based cocktails. Examples include a ‘Green Tea Mojito’ made with green tea, Tanqueray, basil seeds, soda and mint; or a ‘Tea Tini’ with Jing Green Apple Hibiscus Tea, Ink Gin, vermouth and lemon peel. The bulk of the food menu leans towards gourmet sandwiches, while the chef’s signature dish is a twist on the classic smashed avo, made using burrata, mashed avocado, spring onion, red chilli, toasted sesame, crushed cashew nuts and black tea salt on sourdough. The opening of G&Tea is part of a $1 billion capital works project at The Star Sydney, with upgrades or additions to the existing dining, retail, function and event spaces. “The launch of G&Tea is another stunning example of our commitment to creating thrilling experiences for our guests and to transforming The Star into Sydney’s premier dining and entertainment destination,” says Dino Mezzatesta, Chief Operating Officer of Hotels, Food & Beverage and Retail at The Star. Located on the ground level of the Astral Tower with a 74-seat capacity, G&Tea is open seven days a week, 6.30am – 11pm Sunday to Thursday and 6.30am – midnight Friday and Saturday.